These stylish designer Versace VE3206 eyewear frames for women are both flirty and fun, adding the final piece of perfection to your look. The use of plastic and metal means you'll get the best of both worlds when it comes to your eyewear. You'll have reinforced frames and your Versace VE3206 glasses will be more durable and strong. The unique combo of plastic and metal that make up your frames add an extra sense of cool, meaning you'll be ahead of the pack with these fashion-forward frames. Fully rimmed Versace VE3206 eyeglasses' frames are perfect if you want to make a statement with your eyewear while fully protecting your lenses. Ladies, if you've got a diamond or square face, you'll be able to enhance your features with these beautifully designed cat-eye glasses. If you're the type of women who appreciates style and femininity, these are the perfect frames for you. 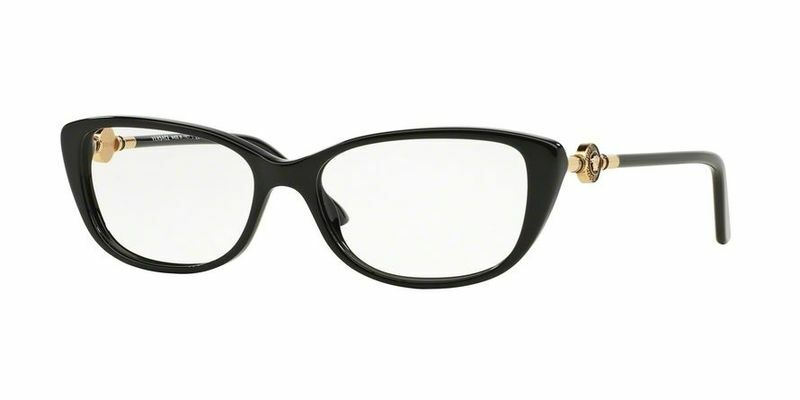 Cool Versace VE3206 frames are a must-have addition to any fashionista's wardrobe. If you love to wear looks right off the runway, you'll love these trendy glasses. And if you consider yourself to be truly fashionable, this trendy eyewear style will take you beyond mainstream fashion.